* Effiom Otu Bassey, the former winger of Bukola Babes FC, who joined Norwegian top level side Lillestrøm SK this summer, is born 24.06.1992 according to http://www.lsk.no. Bassey became the first ever Bukola Babes-player who joined a foreign club. Personally, I think top scorer Abdulrahman Bashir could be the next in line. Bashir, who has scored nine league goals at the time of writing, is a petit striker who can score from any angel. Bashir is still a teenager and has been training with the Nigeria U-20 national football team during the season. * I was rather surprised to read the news that Arsenal FC, the English top club, is tracking Taofeek Morenikeji Akanbi, the top scorer of Crown FC. As always, I am very skeptical to such reports but obviously, you never know with Nigerian football. Apparently, Arsenal watched Akanbi when Nigeria U-17 played DR Congo U-17 on 12.09.2010. According to MTN Football, a player called “Akanbi Toyosi” played in this match and I have always thought that this was a different player then Taofeek Morenikeji Akanbi at Crown FC. However, usually reliable website SoccerAssociation has profiled a Crown FC-player called “Morenikeji Toyosi Akanbi” so I guess this is the same player. SoccerAssociation also writes that Akanbi is 178 centimeters and 68 kilos. Akanbi has recently been described as a “17 year old Nigerian striker” in local media. However, Akanbi writes that he is born 11.11.1994 at his personal Facebook-page so there seem to be some confusion regarding his correct birthdate. Akanbi has scored seven league goals during the Nigeria Premier League 2010-2011. *Ibrahim Obayomi has left Crown FC and joined Maritimo, playing at top level in Portugal. According to zerozero.pt, Obayomi is born 20.01.1989. 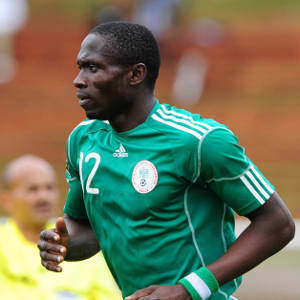 Obayomi, a center forward, scored one goal in the Nigeria Premier League 2010-2011. * I have previously written that Kabiru Umar who played for JUTH FC during the first half of the current season is the same player as Kabiru Umar at Enugu Rangers FC. According to SuperSport, Umar of Rangers, described as a “free-scoring attacking midfielder”, joined the club from Adamawa United FC and not JUTH FC. * Bright Silas is one of the most important players at JUTH FC and deserves attention. Silas is a petit winger who has been with JUTH FC at least since 2007-2008. According to http://juthfootballclub.blogspot.com/, Silas is born 19.11.1992. * There is a very interesting twist to the transfer-story regarding Uche Nwofor who has reportedly signed for VVV Venlo in the Netherlands. In the Netherlands, there is a so-called minimum-wage rule regarding non-EU players. Non-EU players that are over 20 years old have to earn a salary of minimum € 532 000 per year. However, non-EU players that are under 20 years old have to earn a salary of minimum € 266 000. I have previously pointed to the fact that the former club of Nwofor, Anambra Pillars FC, stated that Nwofor was born 28.02.1989 on their official webpage and not 17.09.1991, which is the date of birth he registered before joining the Nigeria U-20 national football team. If Nwofor is indeed 22 and not 19, he should actually qualify for the € 532 000 minimum salary at VVV Venlo. Personally, I think that a rather modest club as VVV Venlo could struggle to pay such a high salary, but this is only speculation from my side. In any case, Nwofor made some impressive performances in the FIFA U-20 World Cup this summer, scoring two goals when Nigeria U-20 won 5-2 against Croatia U-20. The picture is of Nwofor and is taken from SuperSport. * George White Agwuocha (born 13.01.1993), the versatile winger / attacker at Sunshine Stars FC, has joined Odd Grenland in the Norwegian top division. * Oke Akpoveta (born 09.03.1992) of Warri Wolves FC has also moved to Scandinavia and the Danish top club Brøndby IF. Akpoveta is primarily a center forward and is 178 centimeters. He has scored one goal during the Nigeria Premier League 2010-2011. Top scorer Ekigho Ehiosun (born 12.05.1989) has joined Turkish outfit Samsunspor on a loan deal so I guess the question is: who will score the goals for Warri Wolves FC for their four remaining games of the season? Personally, I have a theory that Oduopke Oghogho could be the next attacker at Warri Wolves FC heading for Europe. Oghogho, who I believe is playing his third season at Wolves, is kindly referred to as “Raul” and at times he has been brilliant this season, scoring four league goals, an all-time high for the creative player. * Ghazali Mohammed (born 20.05.1985) of Zamfara United FC has finally found his scoring boots and scored his first goal of the season at 17.07.2011 against Heartland FC. Mohammed played for Assyut Petrol (Egypt) in 2006-2007 and is one of the most experienced performers at the youthful Zamfara-side. This little “scam” is obviously not a big deal but the bottom line is: one should always be very, very skeptical to these CV’s that are floating around on the internet. When not even the pictures can be trusted, one should always quality check the data that is presented, especially the birthdates and the goal scoring records.